A dreamy blend of creamy vanilla and summer evening lavender. For smoother, more touchable skin, massage in to dry areas. Avojuice Vanilla Lavender Juicie 960ml is rated 5.0 out of 5 by 3. Rated 5 out of 5 by Fulanne from Best hand and body lotion ever I'd give this more starts if I could. I am an OPI fan and have used their nail products for many years but I can't find the words to praise Avojuice enough. The difference it's made to the condition of my hands is remarkable, a huge thank you to OPI. I only used it as it was in a kit I'd bought from QVC, but I've now got bottles in my bedroom, bathroom and kitchen, plus a small bottle in my handbag all in various fragrances,I just wish I'd tried or earlier. Rated 5 out of 5 by Jane from Beautiful moisturizer I really like the avojuice and use it daily. I started with ginger lilly but once I tried Vanilla Lavender it became my firm favourite. The cream goes on your skin really well and doesn't leave any greasy residue. 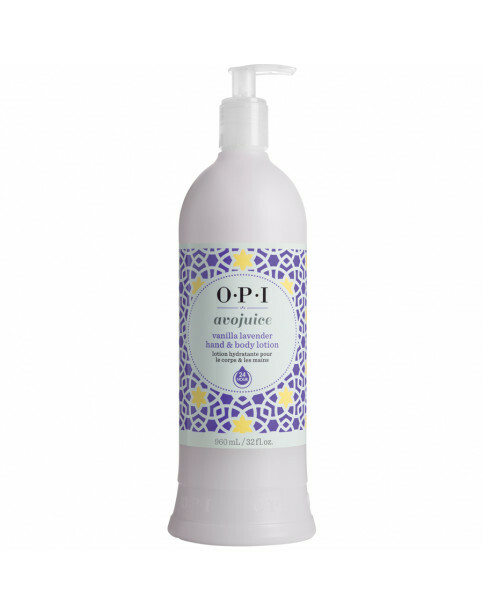 It keeps my skin in great condition and the vanilla lavender has a particularly lovely smell.